As I’ve grown up, I have learned to gain an appreciation for everything which Nintendo, Sony, and Microsoft do for their console gaming audiences. Because of this, I have never really bought into the whole “console wars” thing. Each particular brand has their perks in addition to stellar franchises. Even so, if I was to single out one particular gaming brand that means more to me than all others, Nintendo would be given that honor. You could easily credit nostalgia for this, given that my earliest gaming memories are traceable to the Nintendo 64. (I still frequently play some of my favorite N64 games via the Virtual Console on my Wii.) But if you remove nostalgia from the equation, the vast majority of acclaimed games that Nintendo has released throughout the years hold up amazingly well. Most of these include the Mario Kart games. They have their issues, but nonetheless, it’s easy to see why that series has been so popular all these years. The gameplay formula is simple, the item-heavy gameplay makes multiplayer quite competitive, and it has appeal for families who want their children to pay more innocent games. 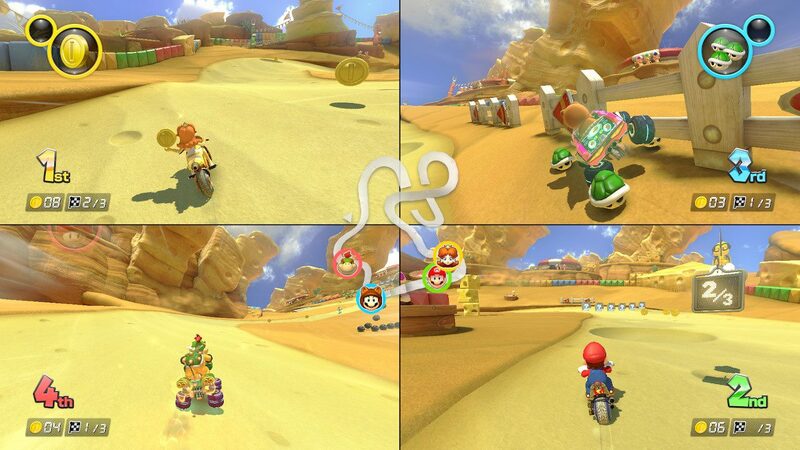 Mario Kart has also been one of Nintendo’s flagship franchises for online multiplayer, despite its lack of viability for the competitive gaming scene. I’ve loved Mario Kart for as long as I can remember, but to be quite honest, I have had an experience with the latest installment akin to what happened with me and The Legend of Zelda: Breath of the Wild. In that context, Breath of the Wild made so many groundbreaking changes and improvements that its resulting quality basically ruined all other Zelda games for me. Not that those titles have now been rendered unplayable, they just pale painfully in comparison to the innovations made in the latest game. The same goes for Mario Kart 8 Deluxe — the updated Switch port of Mario Kart 8 for the Wii U — and Mario Kart 64, for example. Obviously, the graphics are vastly different in quality, yet the subtle improvements in the core racing gameplay have made a huge difference in 20 years or so. 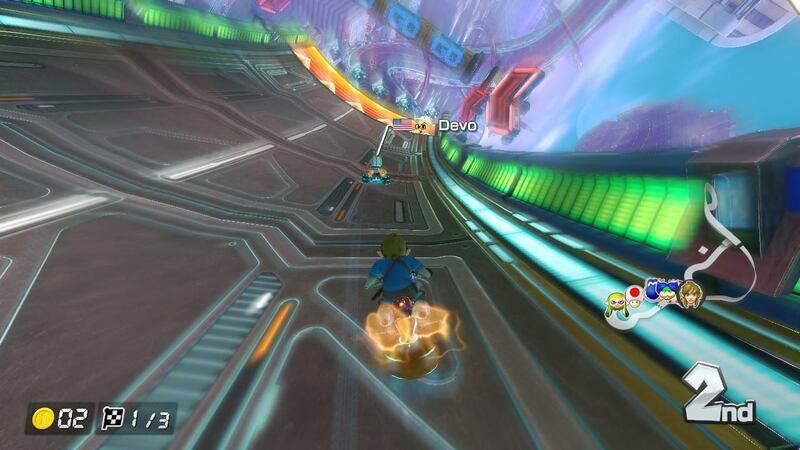 Even in the transition from Mario Kart Wii and 7, the latest game shines because the developers didn’t seem to focus on pushing a gameplay gimmick. Sure, Mario Kart 8 introduced zero gravity racing to the mix, but never did I feel like it worsened the fundamentals; in fact, this design change reinforced their importance. Additionally, the developers made enough tweaks with the rudimentary racing mechanics to make Mario Kart 8 the most intense, fun, fast, and most tightly-controlled game in the series while never sacrificing simplicity. It arguably has the most straightforward, basic control scheme of any Mario Kart game over the past 15 years, and yet it’s equally the hardest to master. But I don’t necessarily mean that as a negative, for the focus on pure racing forces players to actually learn the game’s more expert techniques. As a seasoned, highly experienced Mario Kart player, this design philosophy was very rewarding for me. The fact that one actually needs to consider the weight, acceleration, traction, speed and other statistics with their kart/cycle customizations only emphasizes this point since a player has to develop their own specific racing style they can adapt to different tracks. And, of course, one can never expect to win without mastering the drifting technique; the addition of the Ultra Mini Boost in this updated version adds an entirely new (and incredible) sense of speed which can be extremely helpful to those who want to win tough matches, particularly when playing online. 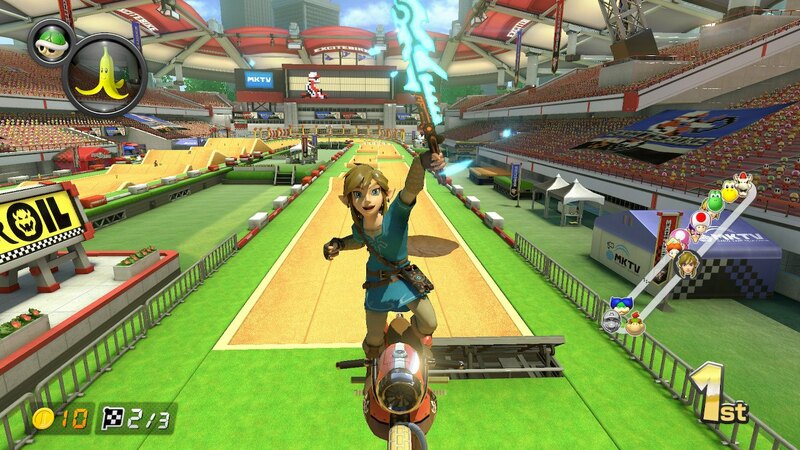 Mario Kart 8 Deluxe also excels by how much these gameplay enhancements inform the track designs. This game is impressive for the fact that it comes packaged with 48 tracks from the start, and almost all of them are plenty of fun to play on. A few are more barebones than others, but for the most part, these tracks greatly tested my driving skills, forcing me to adopt new gameplay strategies and experiment with kart customization options. Such was especially true in tracks which pushed the limit of the game’s zero-gravity mechanic. I’ve come to re-learn the principle of “practice makes perfect,” though, and the rewarding sensation which accompanies completing these races at a top tier level is amazing. Never before has a Mario Kart game felt this fast and difficult to master, and yet that’s why it feels so satisfying to play: once you do get a handle of the extremely simple yet perfect controls, what you can accomplish on or offline is glorious. Even so, this game has some severe limitations that I cannot overlook. They may seem like nitpicks for what is otherwise a very strong game, but as one who’s been with this series their entire life, I have to acknowledge these issues. My main problem with this game is that since all characters and tracks are available from the getgo, the sense of accomplishment which previous games triggered is mostly gone. As you completed various things such as obtaining gold trophies in the previous installments’ Grand Prix circuits, characters and other circuits would then unlock as rewards for your actions. Mario Kart 8, similarly to how 7 was designed, changes that formula by encouraging the collection of coins on race/battle tracks. The more of these you obtain, more kart customization options (body, tires, gliders) open up for you to experiment with. While these are enjoyable to unlock on their own terms, getting new characters and circuits was more rewarding to me. But aside from that, another key missed opportunity has to do with the items. Not only do I still feel that certain items can be punishing and overly frustrating to skilled players who can win solely based on their driving ability, the mechanic of obtaining up to two items at a time is limited. Upon first playing the game, I noted how frustrating it was to have one item I need to defend myself from another, but to use that I had to waste a different item. This is because it’s impossible to switch whatever item you have on deck, similarly to how one can freely change their weapons in a shooter. Implementing such a mechanic would have been greatly helpful in situations where you want to defend yourself from terrifyingly powerful offensive weapons. For example, Mario Kart 8 introduces a defensive/offensive item called the Super Horn, which is currently the only means of countering the dreaded blue shell. If the game did allow you to rotate items, then whoever’s in first place could save the Super Horn for when it’s needed. Instead, what we’re left with is a aggravating waiting game for when such a divine defense is obtained. Can you sense the frustration I feel with that particular aspect of the game? Had Nintendo not left one of their buttons unused in an already incredibly simple control scheme, this game would be dang near perfect. That being said, for what it’s worth, Mario Kart 8 Deluxe is the best that the series has ever been. Aside from the praise I’ve already given it, this enhanced update of the Wii U iteration is likely still the best multiplayer you can get for Nintendo Switch. 4-player split-screen is as fun as ever, and a new gameplay addition called Smart Steering is a very convenient option for parents wanting to include their young children without getting annoyed with their terrible gaming skills. When a player veers towards the edge, the game will automatically steer them back onto the track. (On a sidenote, driving off the track isn’t as punishing as other Mario Kart titles; recovery is refreshingly much faster here, keeping the pace of competitive racing strong.) This mechanic was helpful to my wife and I when we played with our sister’s young kids, so I can certainly attest to how well it works in such a setting. A revamped battle mode also makes the multiplayer fresh and exciting. Five competitive gametypes exist for both free-for-all and team-based play, and while some are better than others, each can deliver varying levels of entertainment value. Out of all five, my favorite is Renegade Roundup due to how much it drives competition and quick thinking in order to obtain a victory. Multiplayer shines brightest in the online setting, though. While Nintendo still lags far behind their competitors in this way, Mario Kart 8 Deluxe is one of the best online experiences you can get on the Switch. Not only is this due to the breadth of modes available for players, but also because of its efficient design. Matchmaking is simple and fast, in which one can boot the game up from the main menu and expect to be in a race within under five minutes. You can also expect to be paired up with racers of similar skill levels as well, given that a ranking system exists based on overall online performance. And to top this all off, as long as you have a solid Internet connection, you’re practically guaranteed to enjoy a lag-free match. I’ve only had a few issues relating to latency or being kicked out of a game completely; otherwise, my experience in playing Mario Kart 8 Deluxe online has been great. Graphics and sound design probably won’t matter as much to some given this game’s cartoonish art style, but the quality of the visuals considering the Switch’s handheld nature shouldn’t be taken for granted. With a vast variety of vibrant colors, action always occurring on screen, an extremely fast gameplay pace at times, as well as exquisite details noticeable to those who pay close attention, I’m sure Mario Kart 8 Deluxe demands much from the hardware. Even so, gameplay with one or two more people on the same Switch registers at a gorgeous 60 frames per second; the frame rate drops to 30 fps when 3-4 players are involved, but even so, the textures and character models still look great in that case. As a whole, this game is as fun to look at as it is to play, and the same can also be said for the music. Some tracks might go unnoticed because of how they blend in with the near constant stream of racing noises and character quips emanating from your speakers, but a few musical tracks stand out as amazing compositions on their own. My personal favorite is the exciting piece for the Cloudtop Cruise race, the likes of which incorporates a subtle remix of the Gusty Garden Galaxy theme from Super Mario Galaxy. I’d recommend it to anyone as a fun listen, regardless of whether you play Mario Kart or not. But when viewed as a cohesive package, I won’t be the first to admit that Mario Kart 8 Deluxe carries over shortcomings of previous games. If you’ve been frustrated by the items or initial learning curve of the game’s more complex racing mechanics before, those negative emotions may resurface here, given that other flaws also exist. Nonetheless, this is otherwise an essential game to own for the Nintendo Switch, especially if you like to play with family, friends, and/or people over the Internet. This outstanding step forward for the franchise satisfies in those aspects, while also being a testament to how Nintendo always focuses on releasing games that feel like finished products. Their best titles are almost completely free of bugs, and they are already full with enough content to where DLC doesn’t feel like an unnecessary burden in making an undeservedly full-priced game feel more complete (I’m looking at you, Destiny and EA’s Star Wars Battlefront games). Mario Kart 8 Deluxe is a full package with extremely high replay value, and will most likely satisfy Nintendo Switch owners for a long time coming. I know that such will be the case for me. Mario Kart 8 Deluxe is my favorite game in the series, and you can expect that I will keep on playing it a lot in the foreseeable future. See you on the race track!